Combined heat and power plants (CHP) are on the rise. Not only do they offer the possibility to produce their own electricity but they also directly utilize the waste heat that is generated or use it in local heating networks. It is possible to use commercially available fuels such as petrol or heating oil but it’s preferable to use “green gas”, meaning, gas from biogas plants or power-to-gas plants. Utilizing heat recovery from waste gas makes sense to maximize funding opportunities. Tube-bank heat exchangers are good for this purpose as they combine high efficiency with cost efficiency and low pressure loss. Heat exchangers are “traditionally” developed as follows: someone with a little experience sketches a heat exchanger, takes their idea to the workshop and gets the metal workers to cut and weld them a few lengths of pipe together. After completing the assembly, the heat exchanger is then installed and it is possible to instantly judge its performance. If the results are correct you can go about your business. However, if the heat transfer capacity is insufficient, the area is extended until “it works”. There is no real objection to this approach if material and labor costs are low and you have enough project time to correct any errors that may arise. 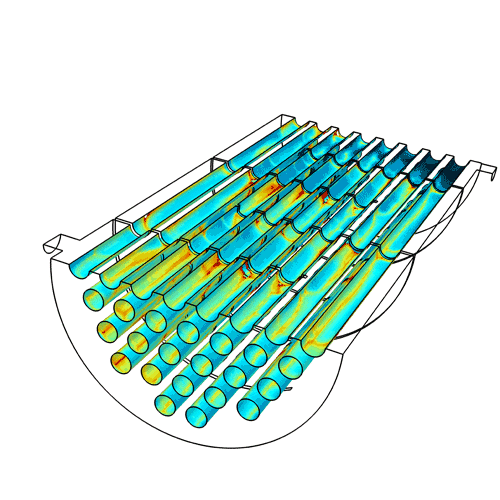 However, if this is not the case, and you require a heat exchanger that doesn’t only “kind of work” but one that performs at peak levels then computational design and optimization is vital. 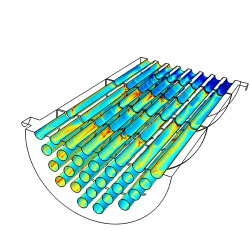 In recent years, Wenger Engineering has designed and optimized hundreds of heat exchangers. “Classic” tube-bank heat exchangers from the VDI Heat Atlas are particularly suitable for CHPs. Calculation for this type of heat exchanger is relatively simple. Nonetheless, the process is repetitive and to propose the best heat exchanger for our clients, intensive knowledge sharing regarding the boundary conditions and the available installation space is required. Heat exchangers in chemical reactors,in which the heat-transfer capacity and the reaction enthalpy are directly coupled. For exhaust heat exchangers built as gas-liquid heat exchangers, the limiting factor is usually on the gas side. In the case of tube-bank heat exchangers, this is usually down to the inside of the tubes. Since internally finned pipes are usually not suitable for cost reasons, heat transfer performance must be “purchased” using small pipe diameters and large pipe lengths to fully take advantage of the resulting pressure loss. And, pressure loss is exactly what you don’t want to happen. However, the following also applies to heat exchangers: nothing comes from nothing. The system simply won’t function without pressure loss.